In this blog article, which also appeared in the December/January 2014/15 Vol. 19 No. 6 edition of Business Brief (www.bbrief.co.za) Frank Smit, CEO of Bridgewater Learning comments on using e-learning to enhance management training by combining blended learning and just-in-time performance support. There is no doubt that in the last 10 years there has been a phenomenal growth internationally in the use of e-learning (or online learning) for training purposes, and this trend has also started to take off in South Africa more recently with the improvement in technological integration, network access speeds, and general internet accessibility. In schools and universities, e-learning is being used mainly to support lectures or tutorials with notes, readings, assignments, and forum debates. In some Universities, it is also being used to expand attendance at lectures by filming them and broadcasting them live or allowing later streaming access. From our experience, the growth in e-learning in corporates has thus far been largely in training for compliance/legal purposes or to meet needs like induction, health and safety, and process and product knowledge – what can be referred to broadly as “skills training”. 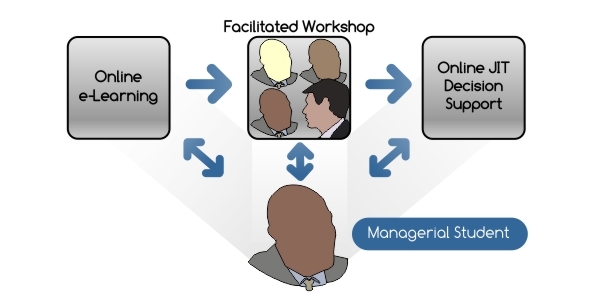 Management training on the other hand, still seems to be provided mainly face-to-face to small groups, on the basis that there is a need for interaction and discussion with an instructor or coach, as opposed to the person learning on their own online. This is all changing however, with the realisation that ‘blended’ learning – that is, an appropriate mix between online and face-to-face training – not only has a number of obvious benefits, but can actually improve the learning experience, knowledge retention, and practical application in the work place. It can also save costs, by cutting down on the face-to-face instructor-led time, travel costs, and time away from work which is a cost which is not often calculated. By having access to study materials beforehand, whether these are in the form of reading, videos, interactive e-learning courses, and assessments, the delegates can learn the theory online before they attend the workshop, leaving a lot more time for discussion and practical case studies in the workshop itself. The delegates can also be assessed on their knowledge gained during both the online study and during the workshops , to see how much they understood and where the gaps still lie. One of the other major benefits is that once the formal learning program is complete, the staff can continue to access the course content online, refreshing their memories and embedding the knowledge further. Where they have particular management tasks to carry out, for example running a meeting, delegating, disciplining, planning, etc., they can easily look up this semi-familiar information for just-in-time performance support. In this way e-learning also becomes the basis of a corporate “e-resource” or toolkit, which not only embeds the management principles they learnt, but also enhances their productivity day-to-day. So, if you are still stuck thinking of e-learning and face-to-face training as mutually exclusive, think no further – they both work together, and the value that ‘e’ adds takes learning and performance to a new and more productive level.